This reflection comes from Julian Brooks. 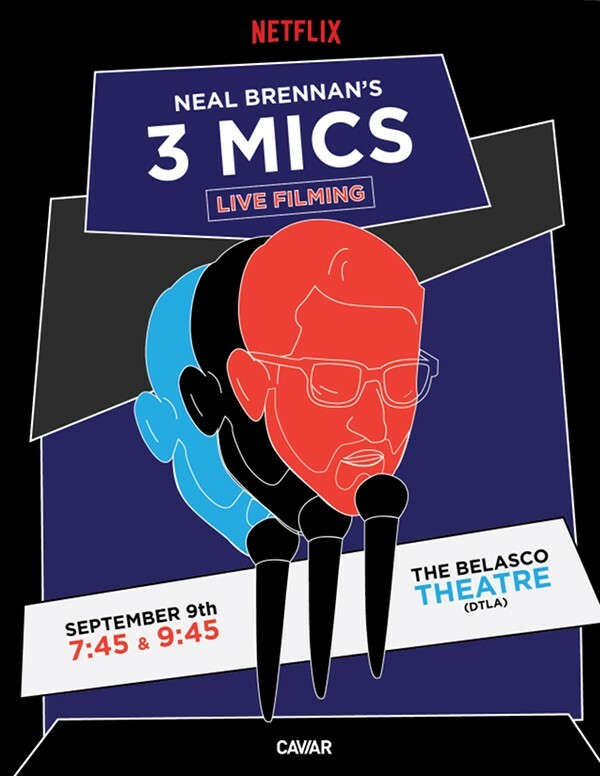 Lately I’ve been on a standup comedy binge thanks to the power of Netflix, and I recently stumbled upon Neal Brennan’s special, 3 Mics. For those of you that don’t know, Neal Brennan was the co-writer of Chappelle’s Show oh too many years ago and has since been quietly writing behind the scenes for several other comedy shows. The special is fantastic in its own right. As the title suggests, there are three mics set up on stage for Neal when the show opens. Each mic represents a different part of the show. One mic for witty one-liners that often cause you to laugh well into the next joke. Another mic for comedic commentary on life’s oddities. And finally a mic to help Brennan bear his soul to a disarmed and captive audience, who probably had no idea what they signed up for. It was on the third mic that Neal shared one of the most honest monologues about depression that I’d heard in years, if not ever. Neal not only discusses his depression but also gives us insight into his childhood, which only compounded his illness. As Neal’s story unfolds you learn that his father was a textbook narcissist and an alcoholic who verbally and emotionally abused him and his siblings. Neal describes very concisely what it is like to strive for the approval of a man incapable of loving anyone other than himself: the horrible exhaustion of constantly being torn between knowing that his father was incapable of loving him and wanting so badly to be accepted by him. As I listened to this horrific tale from Brennan’s life, I began to think about how all too frequently this tragedy plays out. Just in my little circle of friends and family, this kind of broken home is more often the norm than the exception. I believe it to be one of the greatest tragedies, for a child to not be loved and cherished by his or her parents, let alone to be abused and manipulated by them. What’s somewhat ironic is that Neal describes this conversation with his father as freeing and not damning. To hear from his father’s lips what he knew all along actually released him from the treadmill of performance. He was free from the tyranny of an illusion he fought so hard to make a reality. He even describes this transaction as giving him courage to step out of the shadows of writing for other comics and back into the spotlight of standup. It’s very counterintuitive if you think about it, to hear “I never loved you” as a freeing word, but in the context of Neal’s story, I get it. It actually makes sense. Though Neal’s story resonated with me, it’s not because I have had to endure the hardships of an abusive earthly father. Rather I thought about another form of tragedy that is perhaps even more common amongst believers. One that I am still recovering from spiritually. And that’s one of fighting so hard to earn and keep a love that we cannot lose. I am actually still in a season of healing from a decade of fighting with everything in my being to keep my Heavenly Father’s approval. I wish I could blame the church or others for this exhaustion, but at this point I’ve learned this is something we all naturally gravitate towards. The idea that our Heavenly Father loves us when we fail as much as when we succeed is too counterintuitive for our natural minds to understand. Ironically, it is on our deathbeds of performance, when we can no longer fight or pray or do anything that we thought we must do in order to be pleasing to him, that we finally realize he loved us all along. And nothing can ever change that. Thx, Julia. And nice plug for the show. Im gonna watch it. Thanks Sean, its definitely underrated as far as stand up goes. You should enjoy it!